Hopefully wave 2 does enough good business to warrant a wave 3. If a wave 3 happens, what characters/beasts/vehicles would you like to see in the wave? Keep it to 5 figures and one beast/vehicle. XENA: Warrior Princess AND Gabrielle: Battling Bard deserve to be immortalised in plastic as Funko Pops! I just want Superman, but I'd probably get Supergirl if they make her, or any other version of Superman. I could see Shazam since the movie is coming out with a Black Adam to go with. Finally saw the Batcave Primal at Target...massive! A Batmobile would be cool if done as a chariot. That is a great lineup, and would fit in fantastically with a MOTU aesthetic. What a great list...Doomsday I would add. Great ideas! I was thinking more about deluxe figures after I mentioned it and Swampthing & Solomon Grundy would fit this description as well. Need actual Masters of the Universe ones! I like the idea of a deluxe Clayface as like an ogre/troll-type creature or something. I feel like Ra's al Ghul, Swamp Thing, and Cheetah would fit well with the design as well. Or Mordru as a Wizard. That might be getting a little too in the weeds though. Tusken wrote: What about Blue Beetle? has to be Ted Kord! Last edited by ghostrye on Wed Feb 20, 2019 1:20 am, edited 1 time in total. Batwing mount with transparent stand. I think Solomon Grundy and Hyena Men army builders are likely. I see the rest of the Legion of Doom as likely. Still need Grundy, Toy Man, Giganta, Riddler, Brainiac, Sinestro, Cheetah, Grodd. Though I envision Catwoman replacing Cheetah here like how Freeze replaced Captain Cold. If we’re similarly looking at characters who were big in the 80s, I’d lay decent odds on Cyborg, Raven, Beast Boy, Starfire, Nightwing, Firestorm, Supergirl, The Wonder Twins, Black Lightning (with Black Vulcan cues), Zatanna. If we’re looking at anachronistic characters: Harley Quinn, Steel, Cyborg Superman, Bane, Booster Gold and Blue Beetle seem like possibilities. Oh! And if they want to risk a lawsuit: Dr. Destiny. From what I understand, they cannot use any character as they appear in the original comics, which rules out wizards and medieval characters for this line. The looks have to change. This is part of the workaround for Mattel’s license, which remains in force. The designs cannot be based on pre-existing comics or movies and Funko’s “in” here is that these costume designs are new ones they created. That said, Mattel lost the action figure license as of the end of 2019 and I’m hearing that while Spinmaster has the new kids toy license that the figure license may be with one or more other companies in 2020, possibly including Funko, and that we can expect news at Toy Fair next week. If Funko were to be able to produce and mass market 3 3/4" DC Figures I think I might lose my mind... Hopefully that is the case Cobrala Commander. 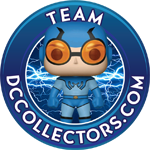 AshleyWilbanks wrote: If Funko were to be able to produce and mass market 3 3/4" DC Figures I think I might lose my mind... Hopefully that is the case Cobrala Commander. I’d be more into 4.5” ala Super Powers and Batman Animated/Justice League. But 3 3/4” is cool too. I’d be happy with the general Super Powers/90s Toy Biz Marvel and DC figure style with new costumes and characters mingling with classics. Something like a Super Powers: Rebirth. Hall of Justice and Batcave based on Snyder’s JLA, King’s Batman. The sort of line where you could get the Rebirth JLA, classic JSA, modern Legion, Metal characters, modern Darkseid, Super-Sons, Young Justice. But compatible with the old playsets. Gordon’s batsuit as a vehicle and Superman’s Kryptonian armor with a Reign of the Superman era black suit Superman. You could have a line that rivals Super Powers without any direct re-dos. Although maybe have re-dos as multipacks so you single card Rebirth JLA and retool them as Silver-Age versions in a 7 pack. Maybe have multipacks all follow Elseworlds themes. Red Son or DKR multipack. Kingdom Come. CW. Cobrala Commander wrote: Oh! And if they want to risk a lawsuit: Dr. Destiny. What about a Manhunter as like a Snake or Dragon? It would be nice to have a Batmobile vehicle, but there doesn't seem to be any indication of high tech in this line like there was in MOTU. So I guess Ace pretty much fills that role. Also would like to see Hall of Justice and Hall of Doom playsets. Hawkman and Hawkgirl I like and maybe Cheetah. rexflexall wrote: Need actual Masters of the Universe ones! Super7 makes them if you want them. They’re amazing. $20 a piece but at least they are high quality and don’t break out of the package. My Super7 figures broke right out of the package. I got replacements but I’m scared to pose them. Funko fixed its 5.5 figures with the Target release. Re-bought the whole line with zero regrets. Funko’s figures aren’t as cheap or hollow feeling as Super7’s. Thinking of selling my Super7 figures honestly and turning my back on MOTU entirely (outside of MegaConstrux) until somebody other than Super7 produces figures. It looked for a bit last year like Mattel was considering a vintage line. Since Super7’s1987 “movie” figures are licensed from the costume designer, I’m personally hoping WB has proper movie rights and can license those to Funko. I have a lot more faith in Funko’s production standards than Super7’s. Harley Quinn to go with The Joker would be a cool one to see. Sinestro would be cool, get everyones arch nemesis!